Athelstane Basebe (1853-1909) and his younger brothers Edgar Allan Basebe (born 1860, St Pancras, London) and Ethelred Basebe (born c1868, Camden Town) were sons of Charles Jones Basebe (1818-1880) a portrait artist and miniature painter. Charles J. Basebe was born in Sussex in 1818. Charles Basebe had shown artistic talent at an early age and by the time he was 17, he was exhibiting his work in London. Charles J. Basebe became a professional artist and earned his living as a portrait painter in London and Brighton. From 1835 to 1879, Charles J. Basebe exhibited portraits and miniatures at the Society of British Artists and the Royal Academy. C. J. Basebe painted portraits of the upper ranks of society and his sitters comprised of clergymen, wealthy gentlemen and members of the nobility, including Prince Albert, Queen Victoria's consort. However, Basebe achieved more public notice as a painter of cricketers. In the 1840s, C. J. Basebe produced a number of full-length portraits of famous bowlers and batsmen, which were later issued as coloured prints. 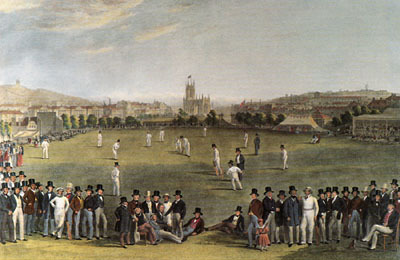 Between 1843 and 1849, Basebe collaborated with William Drummond (born c1811), another portrait painter with links to Sussex, to produce a picture entitled 'A Cricket Match between the Counties of Sussex and Kent, at Brighton'. This panoramic view of an imaginary match at the cricket ground near Brighton's St. Peter's Church, features around seventy individual portraits of famous cricketers and well known "Patrons of the Noble Game of Cricket". All the portraits were "taken from life by Mr W. Drummond and Mr C. J. Basebe" over a period of years and the picture of "The Cricket Match" was eventually published in 1849 as a hand-coloured print (together with a key to the portraits) by William Henry Goodburn Mason (1810-1879), a printseller of King's Road Brighton. ( A few years later, William Henry Goodburn Mason was to play an important role in the early history of photography by allowing Hennah & Kent to establish their Talbotype Portrait Gallery at his Repository of Arts at 108 King's Road, Brighton). Charles J. Basebe and his wife Caroline (born c1821, Bayswater, London), produced at least 9 children, a number of whom became artists and photographers. Their eldest son Charles Edward Basebe (born c1846, St Pancras, London) worked as a portrait painter in London and Bristol. Athelstane Basebe (born 1853, Camden Town) became a portrait painter and a photographer, operating photographic studios in London, East Grinstead, Hemel Hempstead and Watford. Harold Ernest Basebe (born 1857, St Pancras, London) was primarily a watercolour artist, but he briefly worked as a photographer in Worthing in the early 1890s. Edgar Allan Basebe (born 1860, St Pancras, London) became a photographer in Cambridgeshire and from 1901 to 1910 was a partner in the firm of Mason & Basebe, a photographic portrait studio in Market Street, Cambridge. Ethelred Basebe (aka Bertram Basebe), who was born in Camden Town early in 1868, was the youngest son of Charles and Caroline Basebe and worked as a photographer in East Grinstead and Worthing before moving to Watford where he was employed as a photographic artist in the early 1900s. Charles J. Basebe died in Islington on 22nd January,1880, leaving property worth less than �300 to his widow Mrs Caroline Basebe. For the remainder of her life, Mrs Basebe was supported by her children and over the next 25 years she shared her life with her sons, who took turns caring for her. Mrs Caroline Basebe died in 1905 at the age of 84 at Cambridge, where Edgar Basebe worked as a photographic artist. [ABOVE] 'A Cricket Match between the Counties of Sussex and Kent, at Brighton' by William Drummond and Charles J. Basebe , engraved by George Henry Phillips (1849). 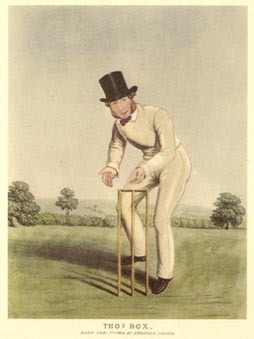 [ABOVE] The famous Sussex cricketer Thomas Box (1808-1876), probably drawn by Charles J. Basebe and published as a coloured print by W. H. Mason of Brighton in 1844. 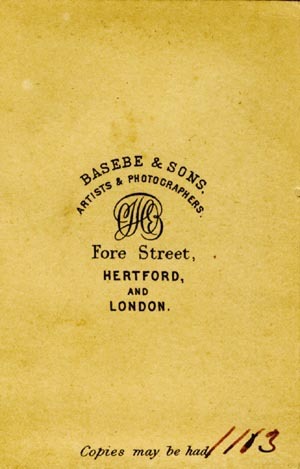 There is evidence that Charles J. Basebe and his two eldest sons, Charles Edward Basebe (born c1846) and Athelstane Basebe (born 1853) operated photographic portrait studios in Hertford and London in the early 1870s. Carte-de-visite portraits dating from around 1872 carry the following details "BASEBE & SONS, ARTISTS & PHOTOGRAPHERS, FORE STREET, HERTFORD AND LONDON". [ABOVE] The trade plate of Basebe & Sons of Fore Street, Hertford. 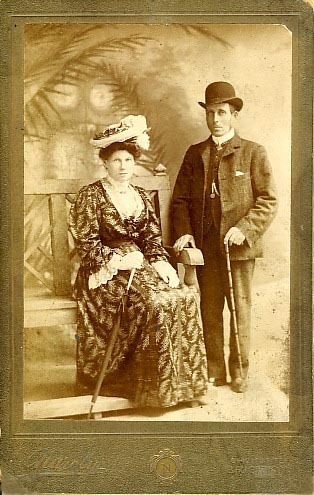 [ABOVE] A carte-de-visite portrait by Basebe & Sons of Fore Street, Hertford. [ABOVE] A report on the exhibitors at the Paris Exhibition of 1878, which mentions the partnership between Athelstane Basebe and Henry James Godbold (1842-1927), a photographer based at 8 Grand Parade, St. Leonards, in Sussex (Hastings & St. Leonards News, 5th May 1878). Pike's Hastings & St. Leonards Directory, which had been corrected to May 1878, includes an advertisement for "Messrs. Godbold & Basebe, Photographers & Portrait Miniature Painters of 8 Grand Parade, St. Leonards and 199 Brompton Road, London. [ABOVE] A carte-de-visite portrait by Athelstane Basebe of 199 Brompton Road, London. [ABOVE] The trade plate of Athelstane Basebe of 199 Brompton Road, South Kensington, London, taken from the reverse of a carte-de-visite. Athelstane Basebe was born in Camden Town, North London in 1853 [ birth registered in the St Pancras District of London during the 2nd Quarter of 1853]. Athelstane was the second eldest son of Caroline and Charles J. Basebe (1818-1880), a well known portrait painter and miniature artist (see above). Athelstane Basebe became a portrait painter like his father, but by 1871 he had turned to photography. At the time of the 1871 census, Athelstane Basebe was living with his parents at 68 Pratt Street, Camden Town, London, and he is described on the census return as a "Photographer", aged 17. It appears that around 1877, Athelstane Basebe was collaborating with the Sussex photographer Henry James Godbold (1842-1927), who operated a studio at 8 Grand Parade, St. Leonards. A newspaper article published in May 1878 mentions "Messrs. Godbold and Basebe, miniature painters and photographers, of 8 Grand Parade". By 1878, twenty-five year old Athelstane Basebe had opened a photographic portrait studio at 199 Brompton Road, S.W. London. He was to remain at this studio address until about 1883. Around the time Athelstane Basebe established his own studio in South West London, he married twenty-three year old Frances Louisa Reid (born 1854, Kentish Town). [ Marriage of Athelstane Basebe and Frances Louisa Reid registered in the Pancras district of London during the 3rd Quarter of 1878 ]. The couple's first child, Frank Athelstane Basebe was born at their home at 199 Brompton Road in March 1880. [ The birth of Frank Athelstane Basebe was registered in the Kensington district of London, Middlesex, during the 2nd Quarter of 1880 ]. When the 1881 census was taken, Athelstane Basebe, his wife Frances and one month old baby Frank were residing in the living quarters attached to the photographic studio at 199 Brompton Road, London. According to a street directory published in 1882, Athelstane Basebe and his family were living at 53 Fortune Gate, N. W. London, a year or so later. By 1884, Athelstane Basebe and his family were residing in the Sussex town of East Grinstead. A daughter named (Catherine) Winifred Basebe was born in East Grinstead around 1884. He appears to have opened his first studio in East Grinstead somewhere in the High Street. 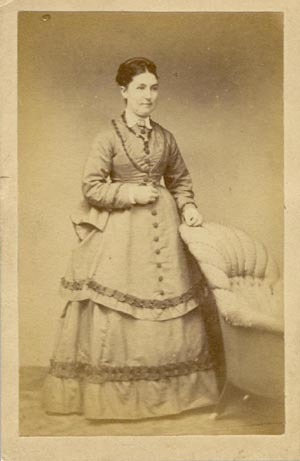 A carte-de-visite portrait has been found which has the following information printed on the reverse "A. Basebe, Miniature Painter and Photographer, 199 Brompton Road, South Kensington and High Street, East Grinstead" and "Exhibitor at the Royal Academy". This carte-de-visite probably dates from around 1883, as Athelstane Basebe first exhibited a portrait at the Royal Academy in London in 1882 and by the beginning of 1884, Basebe's London studio in Brompton Road was in the hands of Russell & Sons. It appears that Athelstane Basebe had moved to new business premises in Moat Road, East Grinstead by 1885. The "Guide to East Grinstead and its Environs", which was published in 1885, advised its readers that there were two "photographic establishments in the town, both in Moat Road". 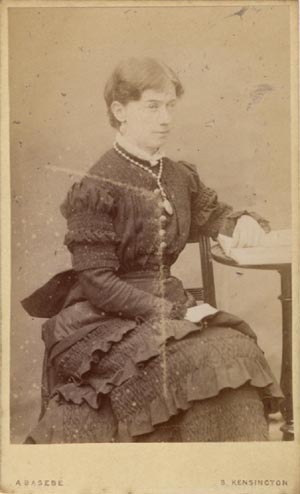 Mary Ann Melville (born 1843, East Grinstead), the widow of photographer Henry Thomas Melville (1833-1878), had been operating her late husband's photographic studio at Moat House, Moat Road, East Grinstead up until 1883, but by 1885 the studio had been sold to William Page junior, the son and namesake of Shoreham photographer William Page. By this date, Athelstane Basebe was based at Oak Croft, Moat Road, East Grinstead. Athelstane Basebe was joined at his Oak Croft Studio in East Grinstead either by his youngest brother Ethelred Basebe (born 1868, Camden Town, London) or another brother Edgar Allan Basebe (born 1860, St Pancras, London). During this period the Oak Croft Studio went under the name of A. & E. Basebe. This means Athelstane Basebe was in partnership with either Edgar or Ethelred. The Basebe family remained in East Grinstead until about 1888. Athelstane and Frances Basebe's third child, Percival Donald Basebe was born in East Grinstead during the First Quarter of 1887. Athelstane Basebe had also completed a watercolour of the well known East Grinstead resident Thomas Cramp (1810-1891) in 1887. By the end of 1888, Athelstane and his family had moved from East Grinstead to Surrey, where his fourth child Arthur Cecil Basebe was born. [ Arthur Cecil Basebe's place of birth is given as Norwood, Surrey, and was registered in the Croydon district of Surrey during the Fourth Quarter of 1888 ]. From 1889, Athelstane Basebe was working as an artist and photographer in Hertfordshire. In 1889, Athelstane Basebe submitted a painting to the Royal Academy and gave a home address in Watford. Between 1888 and 1890, Athelstane Basebe was also taking photographs at an address in Alexandra Road, Hemel Hempstead, where, according to an 1890 street directory, he attended sitters on Thursday and Friday. At the time of the 1891 census, Athelstane Basebe was living in Watford with his wife, Frances, and their four children - Frank, aged 11, Catherine Winifred, aged 7, Percival Donald, aged 4, and Arthur Cecil Basebe, aged two. Athelstane Basebe worked as an artist and photographer in Watford for about ten years. In the 1901 census, Athelstane Basebe gives his profession as "Artist - Portrait Painter". Athelstane's twenty-one year old son Frank Basebe was following his father's profession and he is entered on the census return as an "Artist - Student Painter". While he was living in Watford, Athelstane Basebe entered into a business partnership with Arthur John Millar (born 1870, Barnsbury, London). The partnership between Athelstane Basebe and Arthur John Millar was dissolved on 30th June 1902. Around 1905, Athelstane Basebe left Watford and moved to Croydon, Surrey. Between 1905 and 1909, Athelstane Basebe worked as a painter of miniatures at 163 Lower Addiscombe Road, Croydon. Athelstane Basebe died in Croydon in 1909, at the age of 56. [ Death of Athelstane Basebe registered in Croydon during the 2nd Quarter of 1909 ]. Ethelred Basebe (aka Bertram Basebe) was born in Camden Town in 1868, the youngest son of Caroline and Charles J. Basebe, a portrait painter and miniature artist. At the time of the 1881 census, Ethelred Basebe was living with his widowed mother Mrs Caroline Basebe (born c1822 Bayswater, London) and two of his siblings, Edith and Harold, at 31 Miranda Road, Islington, London. His brother Harold Ernest Basebe (born 1857, St Pancras, London) gave his profession as "Artist -Water Color (Painter)" on the 1881 census return. By this date, at least two of Ethelred's brothers, Athelstane Basebe and Edgar Allan Basebe were working as photographers. In 1881, Edgar Allan Basebe (born 1860, St Pancras, London), was working as a "Photographer's Assistant" in Reading, Berkshire and Athelstane Basebe (born 1853, Camden Town) was running his own photographic portrait studio at 199 Brompton Road, London. 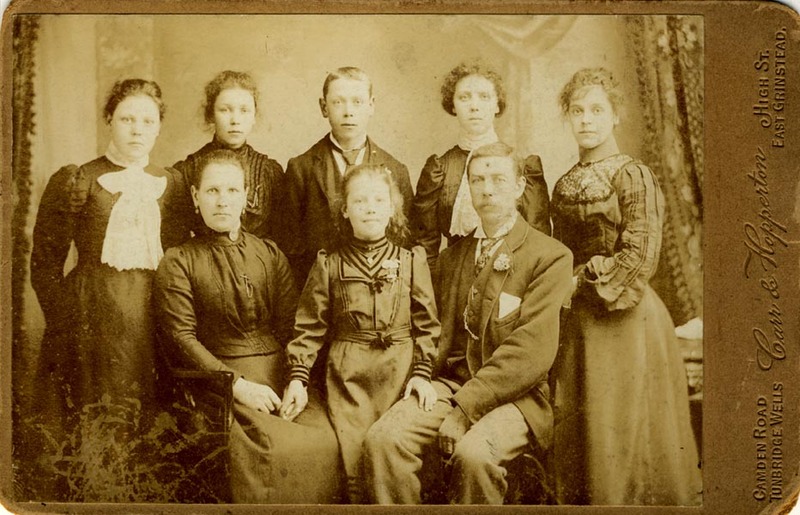 Around 1884, Athelstane Basebe established a photographic portrait studio in East Grinstead. 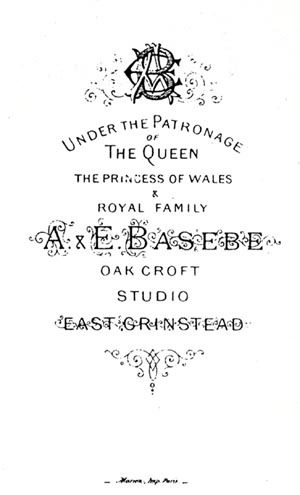 From about 1885, Athelstane Basebe was working from the Oak Croft Studio, Moat Road, East Grinstead and by 1887 he had been joined at his East Grinstead studio by one of his brothers, either Edgar Basebe or Ethelred Basebe. From this date, the photographs taken at the Oak Croft Studio in East Grinstead gave the proprietors' names as A. & E. Basebe. The Basebe studio in East Grinstead closed around 1888. Edgar Allan Basebe married Frances Ann Nunn (born 1863 Duxford, Cambridgeshire) in Cambridge in 1887. [ Marriage of Edgar and Frances Basebe was registered in Cambridge during the First quarter of 1887]. By 1891, Edgar Basebe was living in Cambridge with his second wife Mary Ann (born 1866, Bath) and his son Edgar Elphege Basebe (born 1888, Cambridge). In the 1901 Cambridge census, Edgar Allan Basebe is described as a "Photographer's Assistant", aged 41, but later that year he became a partner in the firm of Mason & Basebe, which had a photographic portrait studio at 19 & 20 Market Street, Cambridge. The studio of Mason & Basebe continued in Cambridge until about 1910. By 1891, Ethelred Basebe was living with his brother Harold Ernest Basebe and his family at 4 Hertford Road, Worthing. Harold Basebe was earning a living as an artist and his profession is given on the census return as "Artist - Water Colour". Ethelred Basebe is described on the 1881 census return as a "Photographer", aged 23. A couple of years later, Harold Basebe was also earning a living as a photographer in Worthing. After 1891, Ethelred Basebe appears to have adopted Bertram as a first name. In 1897, Bertram (Ethelred) Basebe married Jane Lewis Buckley (born 1869, Leominster, Herefordshire), the daughter of Mary Ann and John Buckley, a coal merchant of Leominster. [Marriage of Bertram Basebe and Jane Lewis Buckley was registered in the district of Hereford during the 2nd Quarter of 1897]. Bertram (Ethelred) Basebe appears to have worked as an itinerant photographer over the next few years. 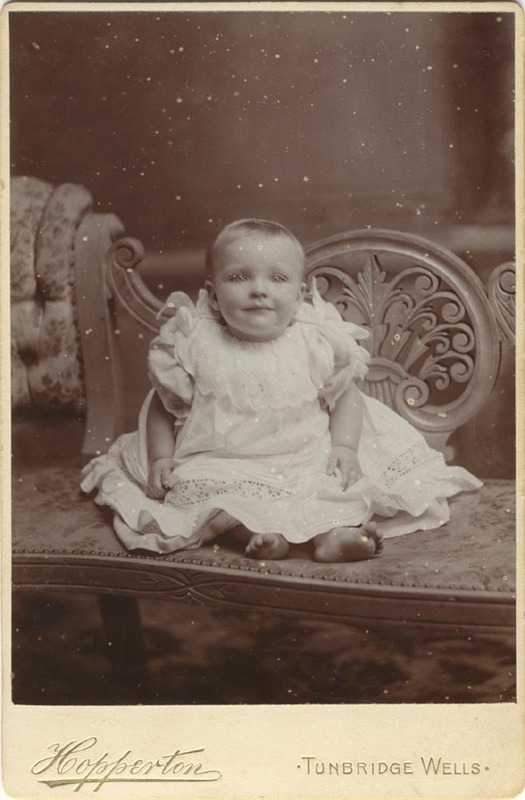 Bertram Basebe's wife Jane gave birth to daughter named Dorothy Marie Basebe in Poole, Dorset in 1898. By 1900, Bertram Basebe and his family were in Keighley, Yorkshire, where another daughter Kathleen Cecilia Basebe was born during the First Quarter of 1900. When the 1901 census was carried out on 31st March 1901, Bertram Basebe and his family are recorded in the All Saints district of Hereford. Bertram Basebe is described on the 1901 census return as a "Photographic Artist", aged 33. [ABOVE] The reverse of a carte-de-visite showing the business address of Athelstane Basebe and his partner E. Basebe (one of his brothers Ethelred or Edgar Basebe) at the Oak Croft Studio in East Grinstead (c1887). The firm of Carr & Hopperton was a partnership between the photographers Edward L. Carr and Herbert J. Hopperton who operated photographic portrait studios in Tunbridge Wells, East Grinstead and Brighton between 1900 and 1906. Edward Leonard Carr was born in Chelsea, Brompton, S. W. London during the June Quarter of 1874. Around 1900, Carr entered into partnership with another photographer named Herbert Joseph Hopperton (born 1877, Salehurst, Sussex) to form the firm of Carr & Hopperton. The partnership of Carr & Hopperton established a studio at 33 & 35 Camden Road, Tunbridge Wells around 1900 and went on to set up branch studios at 23 High Street, East Grinstead (1901-1905) and at 34 & 35 King's Road, Brighton (1905-1906). Edward Carr appears to have been based at the Tunbridge Wells studio in 1901 ( Edward Carr's marriage took place in Tunbridge Wells during the 4th Quarter of 1901), but took responsibility for the Brighton branch after 1905. There is some evidence that Edward Carr was living in East Grinstead in 1904. Herbert Hopperton was based in Tunbridge Wells during the early years of the partnership. Herbert Hopperton is listed as a photographer living in Tunbridge Wells in Kelly's 1903 Directory of Kent and Herbert was married in the town during the Second Quarter of 1903. Herbert Hopperton later managed Carr & Hopperton's studio at 23 High Street, East Grinstead. Kelly's 1905 Directory of Sussex lists Herbert Hopperton as a photographer living in East Grinstead. On 2nd March 1906, the partnership of Carr & Hopperton was dissolved. Herbert Hopperton retained the premises in Tunbridge Wells and continued under the studio name of H. J. Hopperton, while Edward Carr kept the Brighton studio at 34 King's Road. Herbert Hopperton was still working as a photographer at 33 Camden Road, Tunbridge Wells In 1914. Carr & Hopperton's East Grinstead studio at 23 High Street was sold to the photographer Ernest Watts (born 1871, Folkestone, Kent). Ernest Watts ran the studio at 23 High Street, East Grinstead until 1926, when it was taken over by Watt's former assistant Harold Connold (1889-1968). Edward Carr decided to operate Carr & Hopperton's former studio at 34 King's Road under the name of "Naroly". Edward Carr's "Naroly" studio was in business for only a short time. When Towner's Trade Directory was published in 1907, the Naroly studio at 34 King's Road was not listed, although there is evidence that Carr was still in business at the King's Road studio in May 1907. The Naroly studio is not mentioned in Pike's Brighton Directory of 1908 or Kelly's Sussex Directory of 1909, so we can conclude that the Naroly studio was in business in Brighton for only a year or so after it opened in March 1906. [ABOVE] Trade Plate of Carr & Hopperton. Edward Carr and Herbert J. Hopperton formed the firm of Carr & Hopperton around 1900. [ABOVE] East Grinstead's High Street (c1904). Edward Carr and Herbert J. Hopperton opened a branch studio of Carr & Hopperton at No. 23 High Street around 1902. The building fronted by railings on the left was The Capital & Counties Bank. Next door to the bank were a row of shops numbered 15 to 23 High Street. The site of Carr & Hopperton's studio can be seen immediately behind the horses pulling the carriage. In 1906, Carr & Hopperton's photographic studio at 23 High Street, East Grinstead passed to the photographer Ernest Watts. Edwin Cole was born in Canterbury, Kent in 1853. He was the eldest of eight children born to Harriet and George Edward Cole, a carpenter (and later a licensed victualler) of Canterbury. George Edward Cole (born c1828, Canterbury) had married Harriet Pott (born c1832, London) in Canterbury during the 3rd Quarter of 1852. The birth of their first child, Edwin Cole was registered in the district of Canterbury during the 4th Quarter of 1853. Edwin Cole married Sarah Haynes (born 1851 Deal, Kent) in Canterbury during the 2nd Quarter of 1876. The couple's first child, Edith Mary Cole was born in Newington in the London district of Southwark during the First Quarter of 1877. 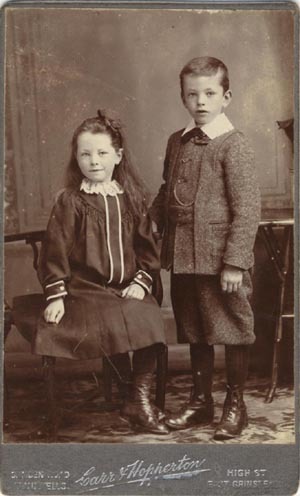 By the beginning of 1879, Edwin and Sarah Cole were back in Canterbury, where their son Alfred Edwin Cole was born during the First Quarter of 1879. Around 1880, Edwin Cole and his family set up home in East Grinstead. Edwin Cole was a picture-frame maker by trade, but there is an indication that Edwin Cole was working as a travelling photographer around this time. When the 1881 census was taken on 3rd April 1881, Edwin Cole was away from home, lodging at a coffee house in London's Gray's Inn Road. Edwin Cole was one of fifteen men boarding at George Harnett's Coffee Palace and Lodging House at 35 Gray's Inn Road, London. Edwin Cole is described on the census return for 35 Gray's Inn Road as a "Photographer & Frame Maker", aged 27. It appears that Edwin Cole continued his itinerant existence. When the 1891 census was taken he was living in Kent with his wife and two children. Edwin Cole died in Margate in 1892 at the age of 38 [ death of Edwin Cole registered in the Kent district of Thanet during the First Quarter of 1892]. [ABOVE] Extracts from the 1881 Census showing details of the itinerant photographer Edwin Cole, lodging at a London coffee house and the census return for 57 Cemetery Road, East Grinstead, where his wife Sarah and their two children were living. In August 1855, two well-known photographers, Joseph Cundall (1818-1895) and Philip Henry Delamotte (1820-1889) of The Photographic Institute of London, were commissioned to take photographs of Sackville College, East Grinstead to support the title deeds of the College. Joseph Cundall also made portraits of the Warden of the College, the Reverend John Mason Neale (1818-1866), and members of his family. Both Cundall and Delamotte later featured their photographs of East Grinstead and Sackville College at various photographic exhibitions across the country. Joseph Cundall was born on 22nd September 1818 in Norwich, Norfolk, the son of Eliza and Benjamin Cundall, a draper. Joseph Cundall was apprenticed to an Ipswich printer, but in 1834, at the age of 16, he moved down to London to work for Charles Tilt, the bookseller and publisher. When he was still in his early twenties, Cundall established himself as one of the leading publishers of popular illustrated books and was well known for his books for young children and juveniles. 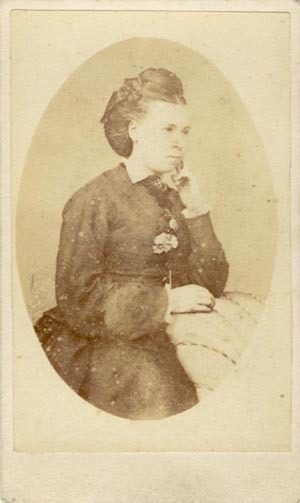 Joseph Cundall married his first wife, Sarah Ranson (1821-1868), in 1845. This first marriage produced three sons and two daughters. After the death of his first wife, Cundall married Emily Ann Thompson (1839-1911) in 1870. This union produced one daughter. An enthusiastic early photographer, Joseph Cundall was a founder member of the The Calotype Club (also known as The Photographic Club) which was established in London in 1847. Joseph Cundall was also a sponsor of the Society of Arts Photographic Exhibition of 1852 and in 1853 he became a founder member of the Photographic Society of London. In 1854, Joseph Cundall authored a 32 page booklet entitled "The Photographic Primer for Beginners in the Collodion Process". Joseph Cundall also allowed his business premises to be used as a venue for one of the earliest commercial photographic exhibitions, where some 350 photographs were displayed and offered for sale to visitors. 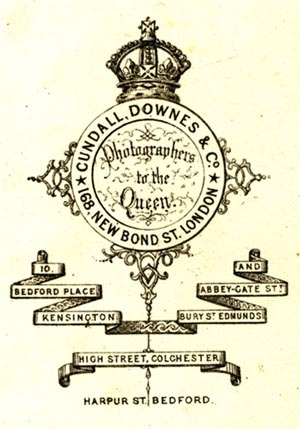 In 1852, Joseph Cundall established the Photographic Institution at 168 New Bond Street, London. Members of Cundall's photographic firm included Philip Henry Delamotte (1821-1889), Robert Howlett (1831-1858) and George Downes (1812-1877). Joseph Cundall often collaborated on projects with fellow photographer Philip Delamotte. In 1853, Cundall allowed Delamotte to stage an exhibition of photography at his New Bond Street premises and in the 1850s he went on a number of "photographic tours" with his colleague. In 1855, Cundall and Delamotte toured Yorkshire together, and a number of their photographs were later published in the book 'A Photographic Tour among the Abbeys of Yorkshire' (1856). In 1855, Cundall produced Philip Delamotte's illustrated book, "Photographic Views of the Progress of the Crystal Palace, Sydenham", which, in a series of 160 photographs, recorded the reconstruction of the Crystal Palace at Sydenham over the previous year. In 1854, Joseph Cundall made a tour of southern England. The Photographic Institution later published a selection of Cundall's photographs entitled "Twenty Views in Gloucestershire." In August 1855, Joseph Cundall and Philip Henry Delamotte, were commissioned to make a photographic record of Sackville College, East Grinstead. A number of these photographs of Sackville College, together with some views of East Grinstead were later shown at various photographic society exhibitions. 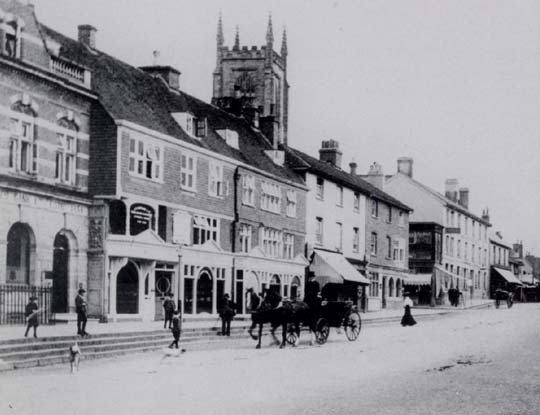 Joseph Cundall exhibited his photographs of East Grinstead at the Norwich Photographic Society's exhibition held in his native town of Norwich in 1856. Joseph Cundall is particularly well known for his series of photographs showing the Construction of the Leviathan or Great Eastern (1854-1856). It was Cundall's associate Robert Howlett (1831-1858) who made the famous portrait of Isambard Kingdom Brunel in front of the Great Eastern's launching chains in 1857. In 1856, Joseph Cundall took a number of photographic portraits of soldiers who had just returned from the Crimean War. This series of portraits appeared under the heading of Crimean Heroes were featured in Joseph Cundall's publication "The Photographic Album for the Year 1857". Joseph Cundall was the senior partner in a number of photographic firms based at 168 New Bond Street, London, between 1852 and 1872. Cundall was in partnership with Lewis Baldwin Fleming (1828-1909) until June 1871. By this date Joseph Cundall was working as the Superintendent of Publications at the Department of Science & Art and in 1871 he was sent by the British Government to France to make a photographic record of the famous Bayeux Tapestry. For a number of years, Joseph Cundall resided in Carlton Hill in the St. John's Wood area of London. Cundall later moved to Kingston-on-Thames and by 1891 he had retired from business and was living at Wallington in Surrey. Joseph Cundall died at his home in Wallington, Surrey, on 10th January 1895, at the age of 76. 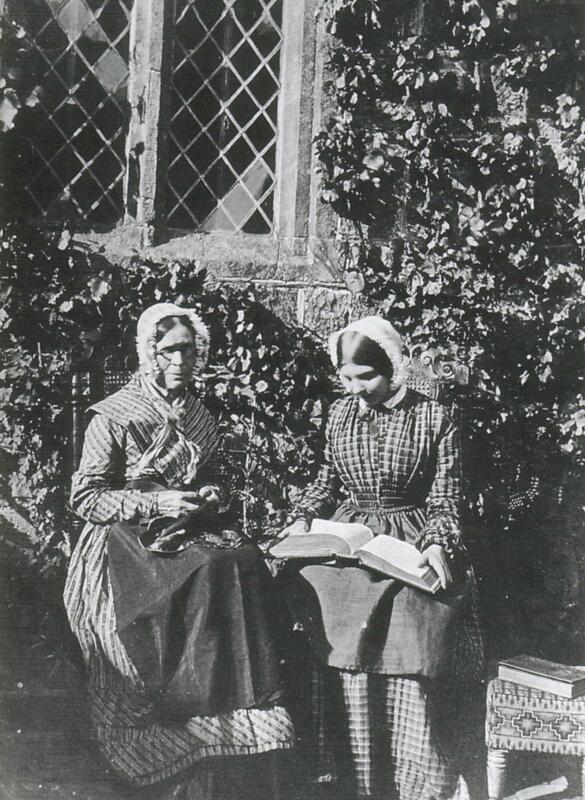 [ABOVE] Two members of the Neale household photographed by Joseph Cundall at Sackville College, East Grinstead in 1855. Collodion print (1855). [ABOVE] The trade plate of Cundall, Downes & Co. (c1864). Joseph Cundall and George Downes' main studio was at 168 New Bond Street, London, but in the 1860s they had branches in Kensington, Bury St Edmunds, Colchester and Bedford. [ABOVE] The various photographic firms associated with Joseph Cundall between 1852 and 1872. Philip Henry Delamotte was the son of Mary and William Alfred Delamotte (1775-1863), an artist who mainly produced architectural and landscape drawings and paintings. Philip Henry Delamotte was born on 21st April 1821 at Sandhurst Military Academy, Berkshire, where his father was employed as a drawing master. Philip Delamotte became an artist like his father and he was eventually appointed Professor of Drawing and Fine Art at Kings College, London. On 4th August 1846 at St. James's Church, Paddington, Philip Delamotte married Ellen Maria George (born 1826, Farthinghoe, Northamptonshire), the daughter of Thomas and Temperance George. The couple made their home in London and from 1853 to 1860 they lived at Chepstow Place, Bayswater, Kensington. During their marriage Philip and Ellen Delamotte produced six children - one son and five daughters. Philip Henry Delamotte was a respected artist and had taught drawing to members of the Royal Family, yet he was also very interested in, what was then, the relatively new art of photography. Delamotte studied the early processes of photography, such as daguerreotype, calotype and collodion and in 1847, together with Joseph Cundall and a dozen or so enthusiasts, he formed the Calotype Club in London. The Calotype Club was also known as The Photographic Club, which eventually evolved into The Royal Photographic Society in 1853. Delamotte became expert in early photographic techniques and by the late 1840s he was teaching photography. Delamotte authored a popular instruction book entitled "The Practice of Photography: a manual for students" and edited magazines which covered the subject of photography. In 1853, Delamotte joined Joseph Cundall's Photographic Institution at 168 New Bond Street, London. Delamotte was to work with Joseph Cundall on a number of photographic projects in the 1850s, including a photographic tour of Yorkshire. Philip Delamotte was one of the first photographers to use the camera for documentary purposes. Delamotte's major work was a photographic record of the reconstruction of the Crystal Palace at Sydenham in 1854. The Crystal Palace was dismantled and transferred from Hyde Park to Sydenham in South London after the Great Exhibition of 1851 came to an end. In 1855, Delamotte published 160 of these photographs in a two volume work entitled "Photographic Views of the Progress of the Crystal Palace, Sydenham". This book and others illustrated by Delamotte's photographs were published by his colleague Joseph Cundall. ( Delamotte was also interested printing techniques for illustrations and as early as 1848 he was a licensee of the anastatic printing process). In August 1855, Delamotte, along with his associate Joseph Cundall, was commissioned to make a photographic record of Sackville College, East Grinstead. A number of these photographs of Sackville College, together with some views of East Grinstead were later shown at various photographic society exhibitions. Philip Henry Delamotte was based at the Photographic Institution's studio at 168 New Bond Street, London until 1855. From 1856, Philip Henry Delamotte operated his own photographic studios in London at 38 Chipstone Place, Bayswater and at King's College, Strand. Delamotte closed his Bayswater studio around 1861. In 1860, Philip Delamotte was appointed Honorary Photographer to the London & Middlesex Archaeological Society. Delamotte exhibited his photographs at the Royal Academy and other London galleries throughout the 1860s and 1870s. At the age of thirty-four, Philip Delamotte was given responsibility for Landscape Drawing and Perspective at King's College, London, and in 1879, the same college appointed him to the post of Professor of Fine Art. In the early 1860s, Delamotte moved to Twickenham, where he lived with his family for the next twenty-five years. [ABOVE] Details of Philip Delamotte's household in Twickenham at the time of the 1881 census. Philip Henry Delamotte died at Highland Road, Bromley, the home of his son-in-law Henry Charles Bond, on 24th February 1889, aged 67. [ABOVE] A group portrait of the Reverend Dr John Mason Neale, the Warden of Sackville College. with his family in the grounds of the famous almshouse at East Grinstead. 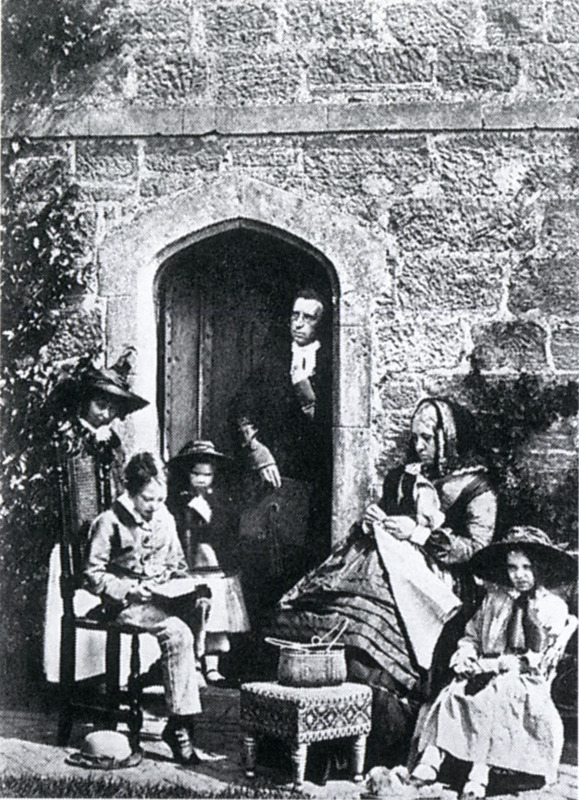 Dr John Mason Neale stands in the doorway and his wife Mrs Sarah Norman Neale is seated on the left.. Collodion print by Joseph Cundall (1855). [ABOVE] "The Old Porch" by Joseph Cundall or Philip Henry Delamotte . 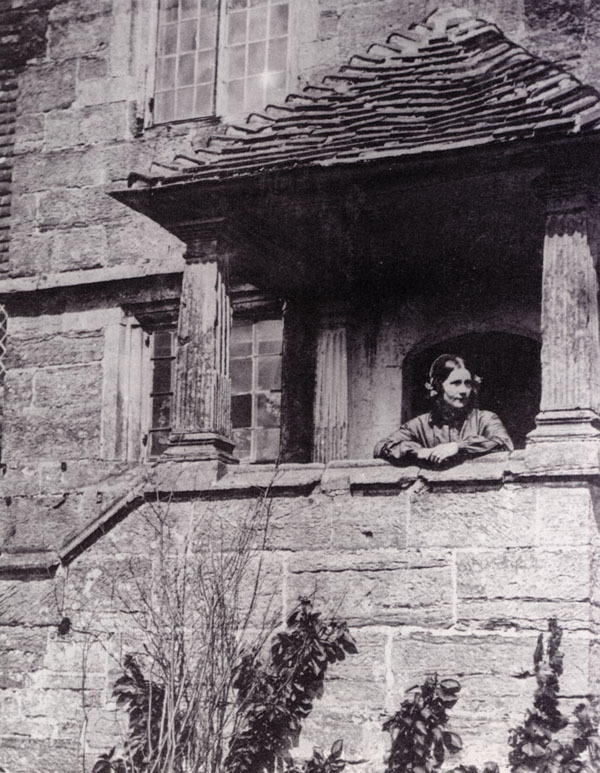 A woman standing underneath the porch at Porch House in East Grinstead. A special thank you to Martin Hayes, County Local Studies Librarian of the West Sussex County Council Library Service. Thanks to Rachel Hurst of East Grinstead Museum for permission to use some of the photograph of East Grinstead. I am indebted to David Gould, Ron Michell and Michael J. Leppard for their work on the photographs and history East Grinstead. Thanks to Philippe Garner for details of the dissolution of the Carr & Hopperton partnership. SOURCES : Books : East Grinstead - Then & Now by Ron Michell and David Gould (Middleton Press, 1985); East Grinstead by David Gould (Alan Sutton,1995) ; Around East Grinstead by David Gould (Sutton Publishing Ltd, 1997) ; A History of East Grinstead by M. J. Leppard (Phillimore & Co. Ltd, 2001) ; One Hundred Buildings of East Grinstead by M. J. Leppard (Phillimore & Co. Ltd , 2006). Articles : Early Photographers in East Grinstead by M. J. Leppard (The Bulletin of the East Grinstead Society, No.18, January 1976) ; Websites : West Sussex Past Pictures website ; Spartacus Educational website; Books and Writers website ; The photoLondon database. SOURCES FOR CUNDALL AND DELAMOTTE : The photoLondon database of 19th century photographers, based on the research of David Webb. " A Directory of London Photographers, 1841-1908 " by Michael Pritchard (PhotoResearch, Watford, 1986). "Joseph Cundall, a Victorian publisher" by Ruari McLean (PLA, 1976). The Books and Writers website.